As some of you saw yesterday from my Instagram pictures. I made a Strawberry Malt Ball Cake with White Chocolate Cream Cheese Frosting for my Mom for Mother’s Day. Today I had a chance to sit down and go through all the pictures and put together a recipe for you. 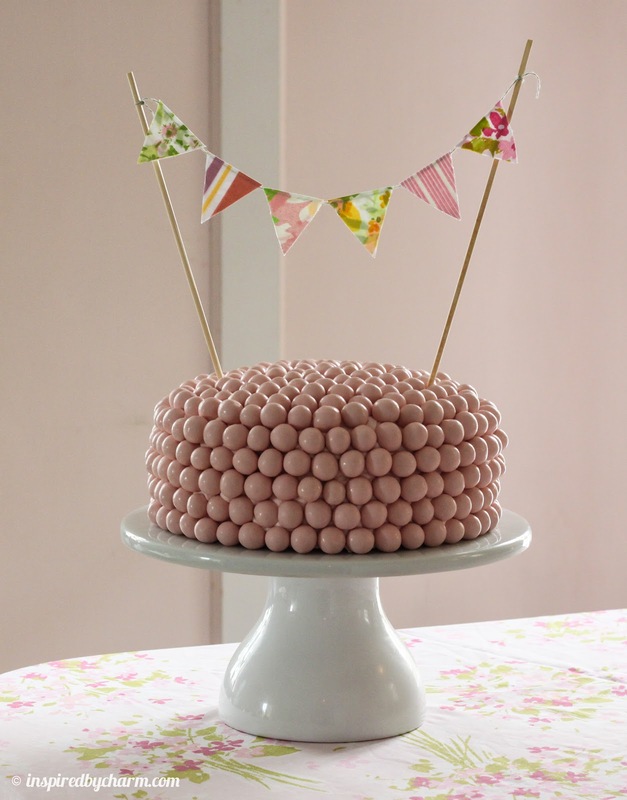 So, may I officially introduce you to my Strawberry Malt Ball Cake. 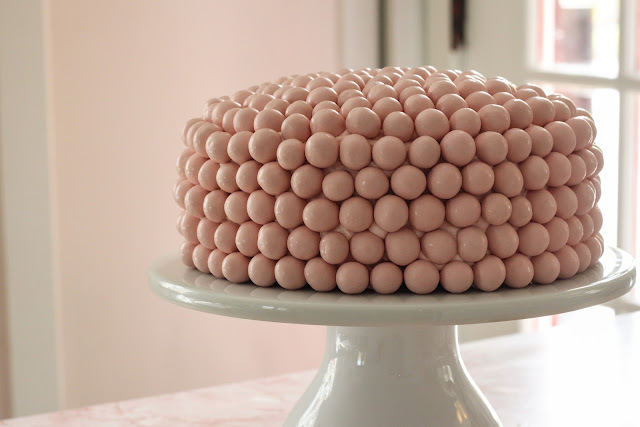 I honestly wish I could say I was the original creator of the Malt Ball Cake, but sadly, I am not. If you do a google search you will see that several creative folks out there have made a chocolate version of this recipe. Though, I think I can safely say I’m the first to do it with strawberry malt balls. That counts for something right? Simply follow the directions on the back of the cake mix box to bake your cakes. I made two 9-in round cakes. I line my pan with parchment paper to prevent my cake from sticking to the pan. While your cakes bake and cool. Let’s make the White Chocolate Cream Cheese Frosting. 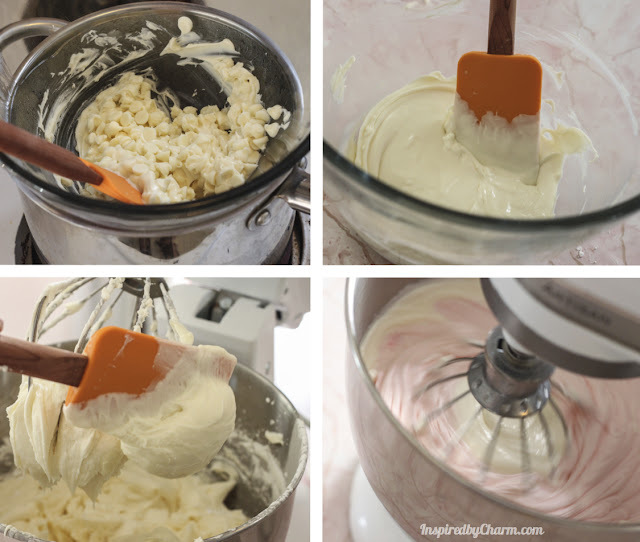 We are going to start by making my Go-To Cream Cheese Frosting Recipe. 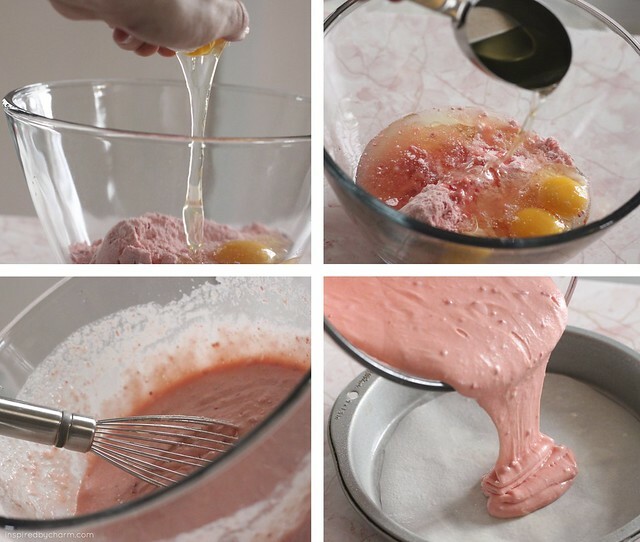 One cup at time, add 2 cups of powdered sugar, beating after each addition. Add vanilla and about 1 tablespoon of cream, and continue beating. Add the remaining 2 cups powdered sugar, one at a time.Add an additional 1-2 tablespoons cream until desired consistency is reached. Now for the white chocolate. Melt an entire bag of white chocolate chips over a double broiler. I don’t have a double broiler so I just used a glass bowl over a pan of boiling water. Once your chips are completely melted, remove your glass bowl from the pan and allow this to completely cool … but not so cold that the chocolate hardens up again. 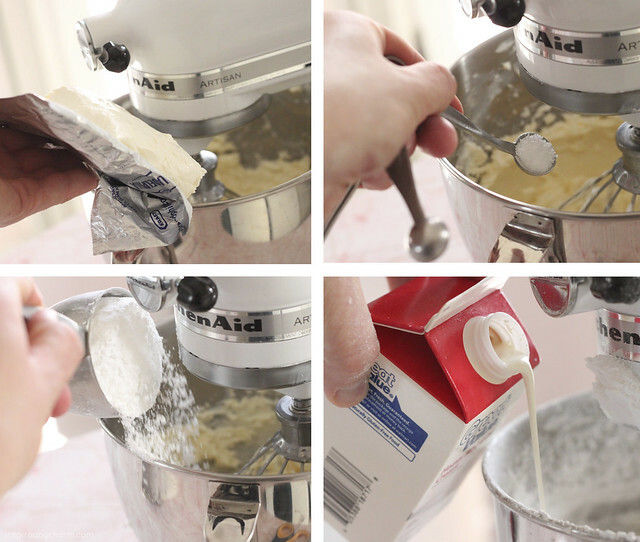 Add your cooled melted white chocolate to your frosting. Mix until combined. I wanted my frosting pink to match my malt balls so I added red food coloring until I achieved a shade of pink I liked. Time to frost the cakes! I lined my cake plate with several pieces of wax paper which I will remove later. This keeps my cake plate free and clean of excess frosting. Props to my gal Ina Garten for that tip! 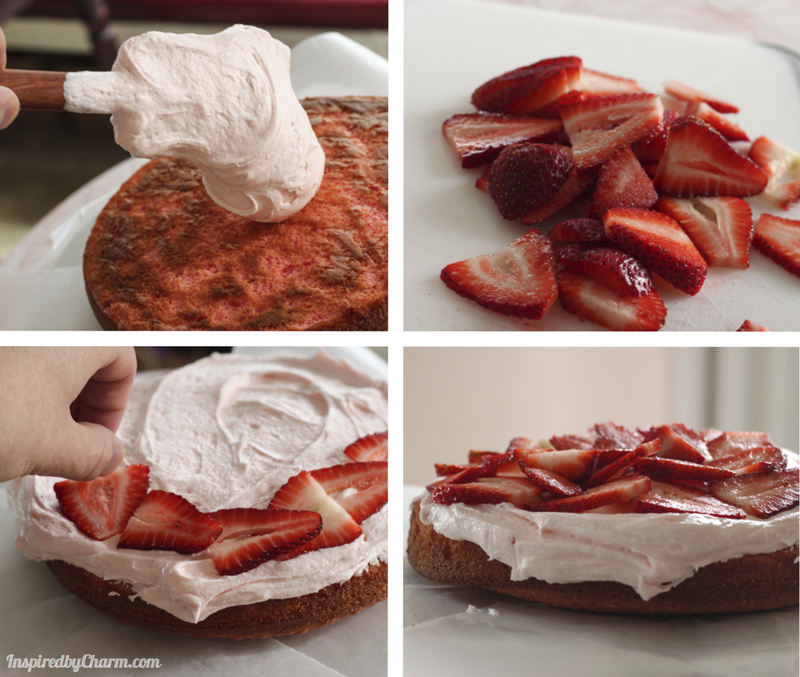 After a layer of frosting, I sliced some strawberries and added a layer of those to my cake. 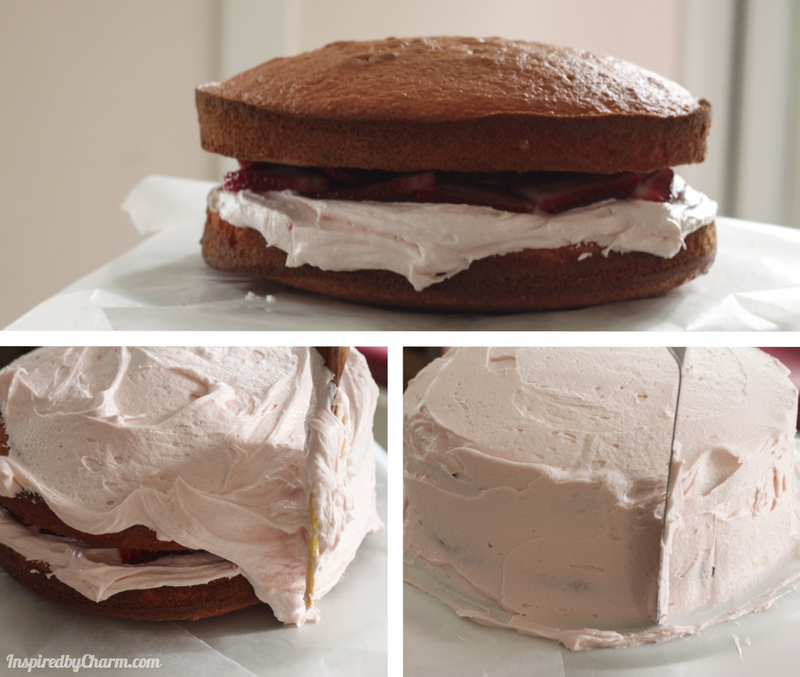 With the strawberries secure, I added my second layer of cake, then continued to frost the rest of the cake. I’m not an expert at adding frosting to a cake. This is why I need that layer of wax paper. I usually just gob it on with my spatula and then use a frosting knife/spatula to remove any excess. Thankfully this cake will be covered in malt balls so a perfectly frosted cake is not required. 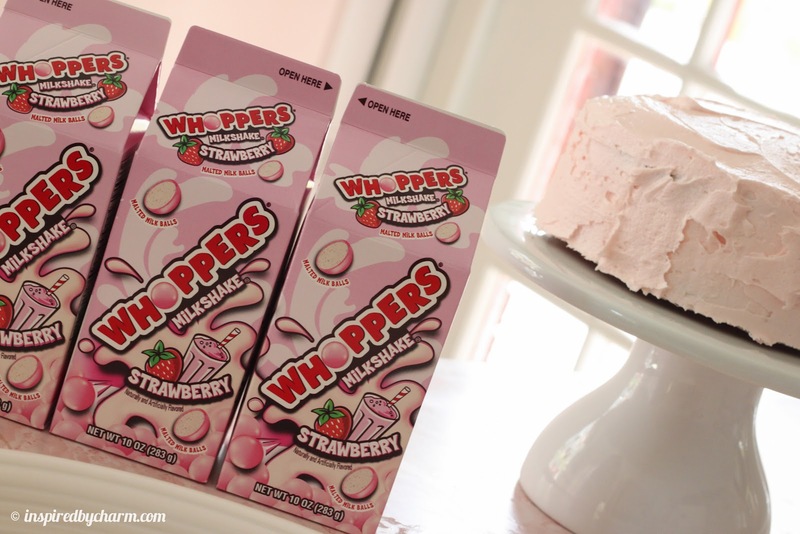 Time for the malt balls, also know as Whoppers Strawberry Milkshake. I ended up using almost three 10oz boxes. Not ten boxes as I planned for. Oops! So this process may seem challenging, but it’s honestly really easy. 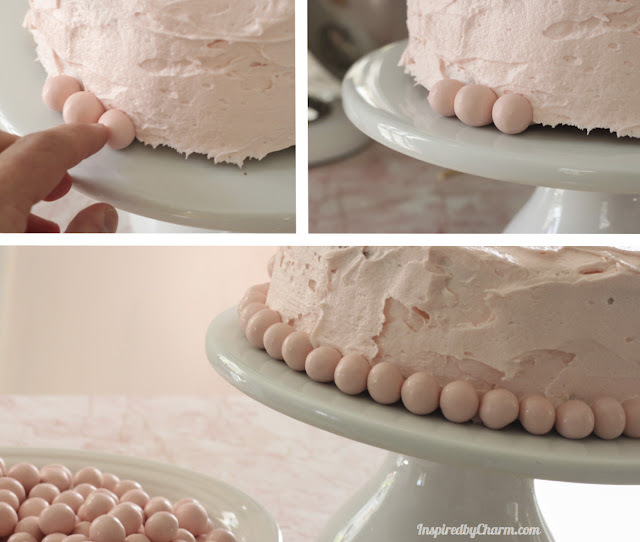 Just start by adding malt balls to the bottom of the cake. Work all the way around until you finish the first row. Continue working up the cake until you reach the top. I offset my second row so that each malt ball tucked in-between two from the first row. 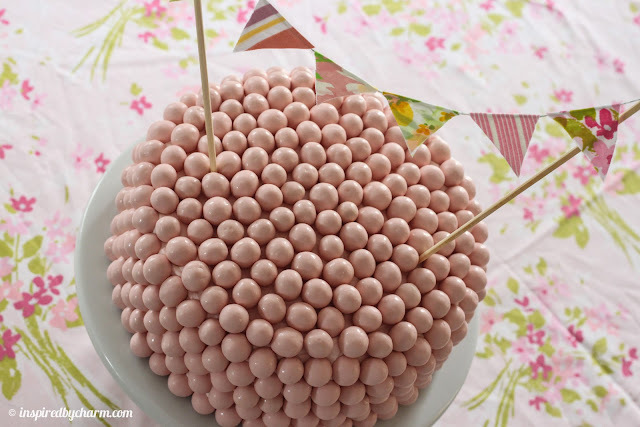 Once you are at the top, just continue to add your malt balls until you reach the center. Ta da! Thanks it! 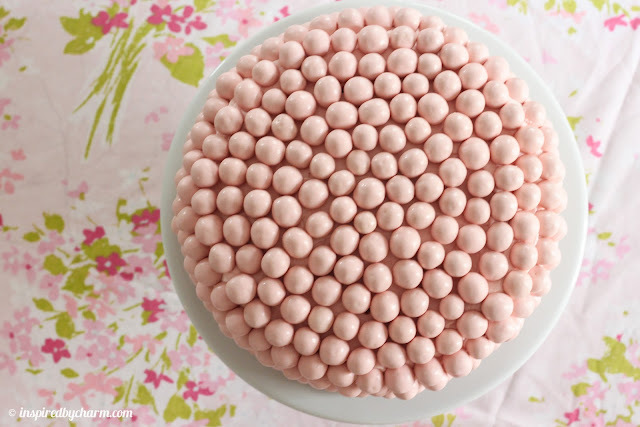 A completely covered cake. Honestly, once you do it you’ll see how easy it is. Pretty beautiful, right? And it smells delicious! 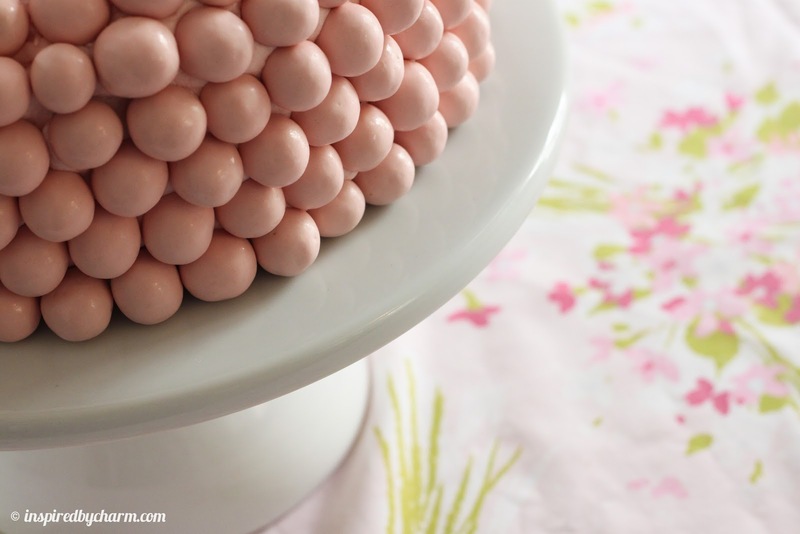 Those strawberry malt balls smell like cotton candy! Yum. As beautiful as the cake is by itself I wanted to make it a little bit more festive. So I grabbed some scraps of vintage sheets, bakers twine, scissors, wood skewers, and tacky glue and made this cute little bunting! The photos are pretty self explanatory, but here how it came together. First, fold a scrap piece of fabric in half. Then cut out a triangle. You want the fold in fabric to be the bottom of your triangle. When you open your cut triangle it should look like a diamond. 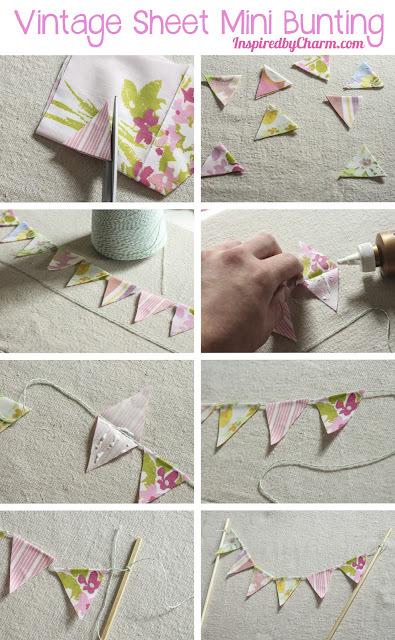 This will keep your bunting looking pretty from both sides. With all your triangles cut, measure a piece of baker’s twine and cut it to fit. Open your triangles and apply some tacky glue. Insert your bakers twine and close your triangles. Continue adding your triangles until you have the desired length. Tie each end of the bunting onto a large wooden skewer. And that’s it! Bunting complete. Stick that beauty into your cake. Seriously, could a cake get any cuter? I’m pretty sure it can’t! And while it does take a little time for the cake to come together the process couldn’t be any easier. A truly professional cake, made at home. Trust me, if I can do this, so can you! Okay, I’m ready for a piece and I want to see how this thing looks on the inside. 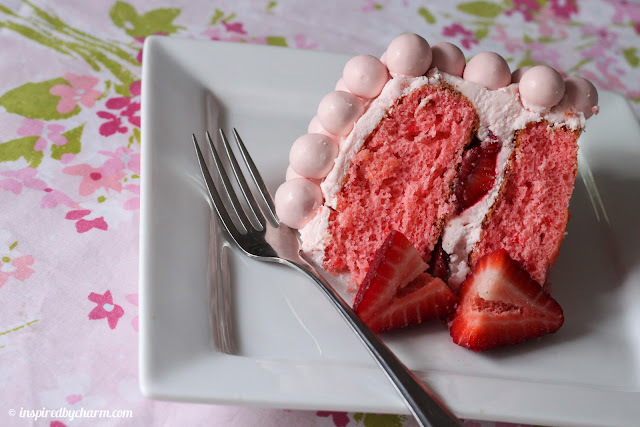 An entirely pink cake! What’s not to love! And yes, that fabric underneath the cake is a vintage bed sheet I picked up at Goodwill a couple weeks ago for a dollar. Time to dig in. Cake, frosting, fresh strawberries and a malt ball for good measure! 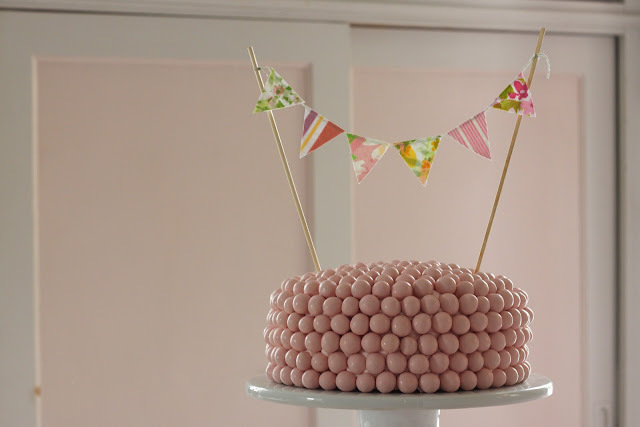 What a yummy and cute cake. You are so sweet to make that for your mother. Oh man! That thing looks delicious and sosososososo adorable! Nailed it! That cake could not, in fact, get any cuter!!! This is so adorable and looks delicious! Beautiful pictures!!! ohh this is so cute and yummy! for sure im making it with my new Kitchenaid I got for mothers day,lol..Come by to look At her, she is pretty!!..hahha..thank’s.. Michael, that is one gorgeous confection! I think I’d be half unwilling to cut into it. But oh, I’d sure like a bite of it! Yummy..gorgeous a piece of tummy art..for my mouth to sink into. You should be proud of yourself. 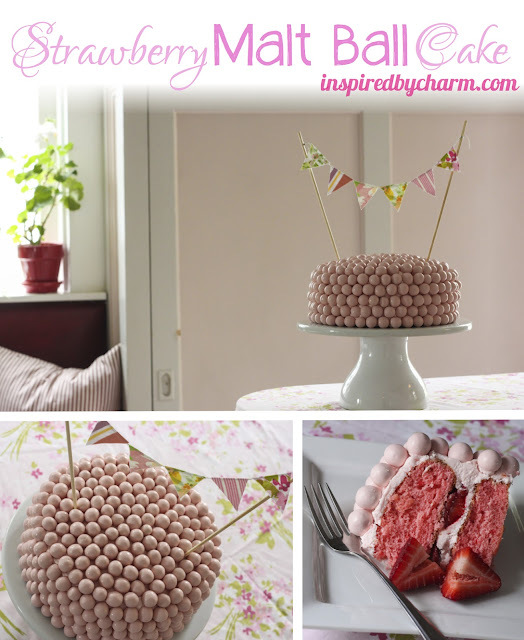 It really is pretty..and tempting me to try to make. I am in love! Think I might just have to put a spin on it for Fathers Day. 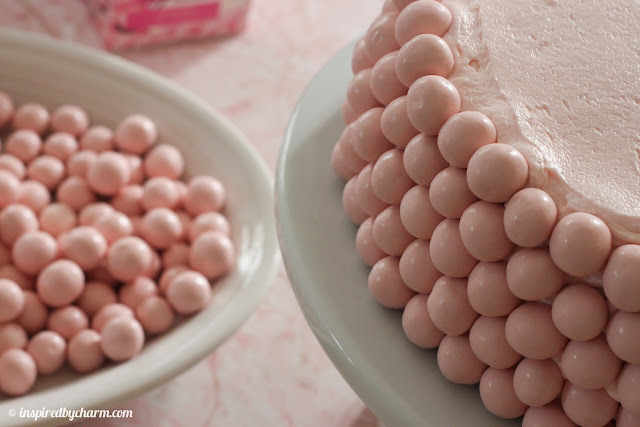 Incorporate some peanut butter malt balls and peanut butter in the frosting for a pbnj cake!?!?! Oh my. Oh my. Oh my. 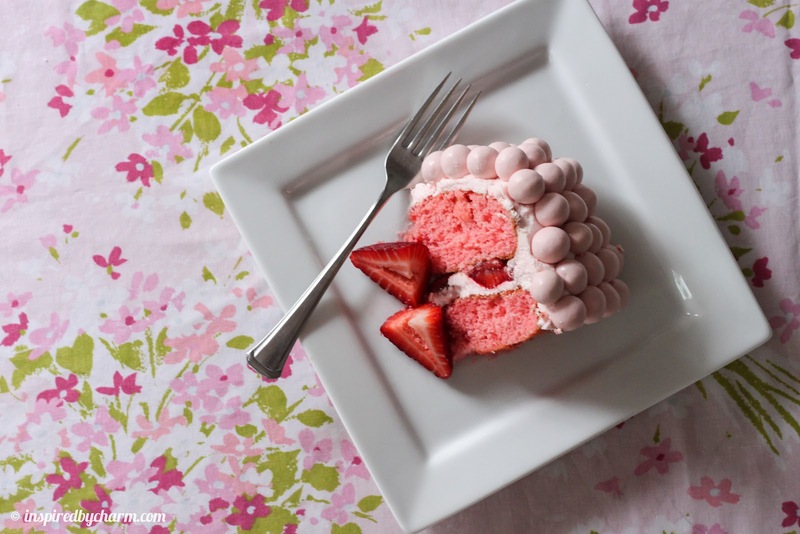 This is such a pretty cake! I’m not sure I’d let anyone eat it! CUTE…and it looks so yummy! All those strawberry malt balls look like great big pink pearls – perfect for Mother’s Day! This is the cutest cake EVER!! Oh man, I love this idea. 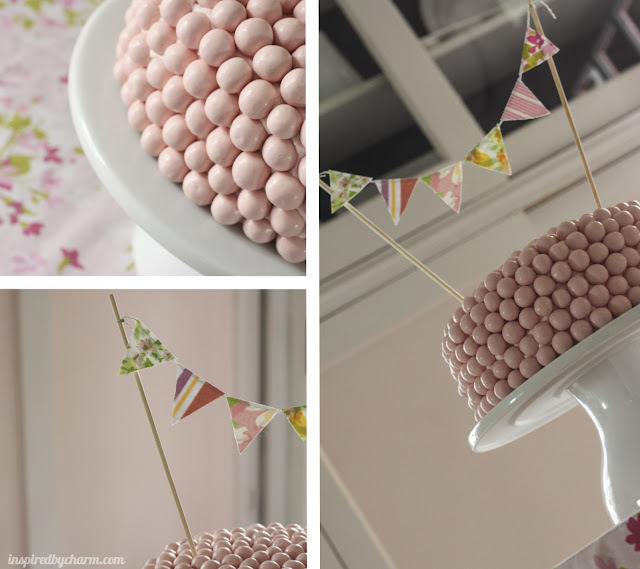 My mom loves malt balls so I’m gonna make her one for her birthday in July. 🙂 I saw that chocolate malt ball cake pinned a few weeks ago and thought it was great but this is EVEN BETTER! Great idea. Thanks for sharing, Michael! 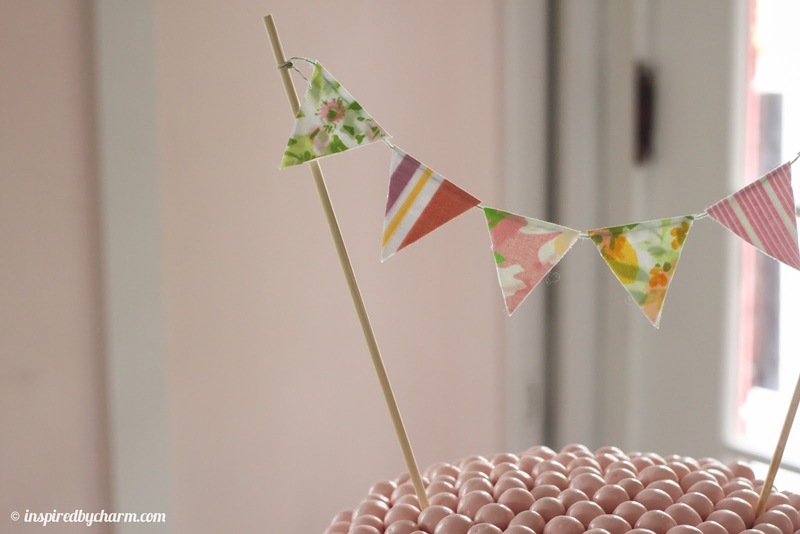 Hip hip hooray for the bunting on the cake AND for the super yummy cake!!! This looks really amazing, Michael! Your cake is so amazing! And the bunting is adorable…well done! that’s just heaven on earth….simply precious!! thank you again for yet another wonderful idea! sharon r.
Are you going to be opening a bakery out of the B&B soon? Because, seriously? This is amazing! 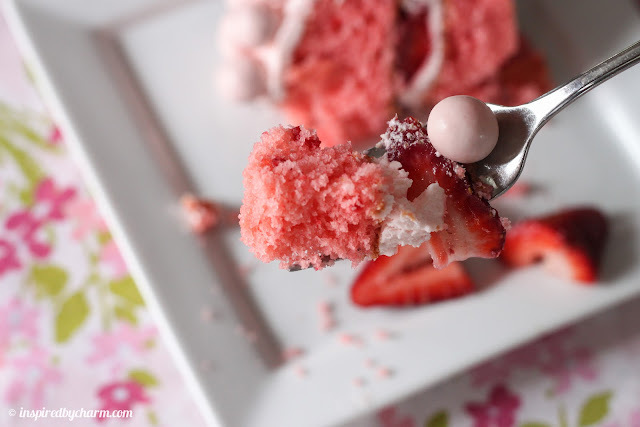 Goodness-that cake is absolutely beautiful and I’m sure is delicious! I’m baking this tomorrow for a charity bake sale. I had to get the cake mix and malt balls sent over from USA to London. I’m excited….